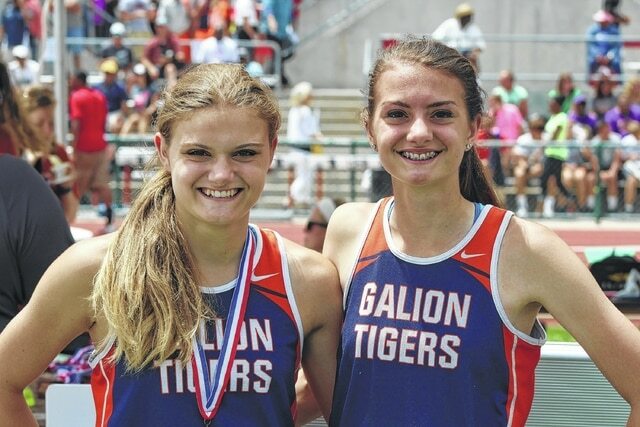 Galion’s M’Lynn and Marisa Gwinner enjoyed competing together at the varsity level for the Lady Tigers basketball squad and track and field team during the 2014-15 school year. The sisters capped off the year with a trip to the OHSAA track and field championships. GALION — Competition between siblings is part of the natural order of the world. Sisters and brothers compete for all sorts of things as they grow up together; toys, video game time, attention from their parents — you name it, siblings will battle for it. For sisters M’Lynn and Marisa Gwinner, the 2014-15 athletic season at Galion High School wasn’t spent so much in competition with each other, but rather alongside each other as teammates. M’Lynn, a junior, and Marisa, a freshman, played together on the Lady Tigers basketball squad and also on the track and field team this spring. The chance to be teammates, said M’Lynn, was a long time in coming. A knee injury that sidelined M’Lynn during the fall volleyball season was the only thing that kept the sisters from both being three-sport athletes this school year. M’Lynn plans to rectify that by playing volleyball in the upcoming season. Like her sister during the fall, injuries limited Marisa to just 14 games during the basketball season. M’Lynn rebounded from her knee injury to play in 20 games for the basketball team. Marisa averaged 8 points and 4.5 rebounds per game and had 10 steals and 10 blocked shots. M’Lynn averaged 4.5 points, 4.7 rebounds and 1 assist per game. The Sisters Gwinner ended their first varsity athletic odyssey together on the field at Jesse Owens Memorial Stadium in Columbus during the OHSAA track and field championships on June 6. Along the road to Columbus, the sisters shared many memorable moments, including winning individual and team titles at the Mid Ohio Athletic Conference meet, plus district and regional event championship medals at Oak Harbor and Lexington. To top things off, each Gwinner walked away from the state meet with a medal. M’Lynn earned her medal as part of the 4×200-meter relay team that reached the podium with an eighth-place finish at the state meet. Marisa placed third in the high jump to collect her medal. The elder Gwinner said, initially, her first state meet experience was a bit on the frantic side. The younger Gwinner said the experience at the state meet was rewarding.